Heidi Crowter speaks at the World Down Syndrome Congress. A global conference celebrating people with Down’s syndrome has taken place in Scotland for the first time. Over one thousand families, health care professionals and researchers were at the Glasgow event last week, taking part in sessions on social inclusion and communication. First Minister Nicola Sturgeon spoke to delegates at the event, and one of the organisers said the conference had already helped to foster positive attitudes in the city. 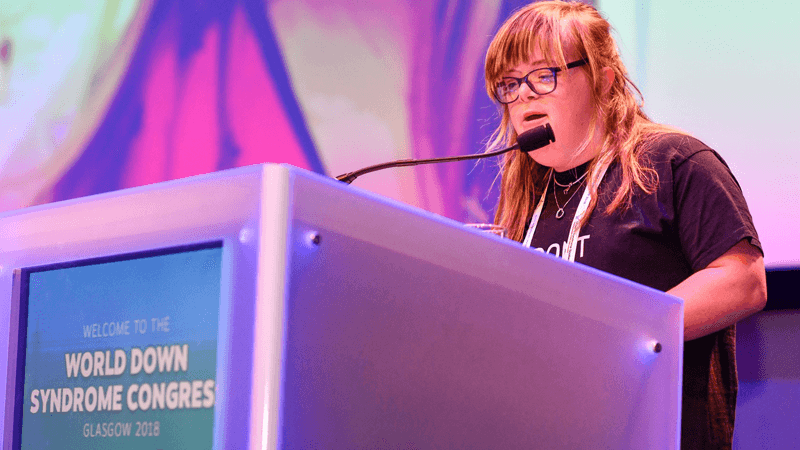 The World Down Syndrome Congress aims to ‘widen opportunities and improve lives’. It promotes research into the condition, with speakers this year holding discussions on developing fine motor skills, independent living and human rights. Currently in Scotland – as in England and Wales – abortion for a child thought to have Down’s is legal up until birth. A new, more accurate, pre-natal screening test is set to be rolled out in England later this year which critics say will lead to more abortions. At the conference, Heidi Crowter – a campaigner who challenged misconceptions about Down’s in a BBC video in 2016 – spoke on independent living. Crowter explained how she wanted to “inspire parents to consider the unique way of using direct payments to help their child to become independent and lead a great life”. Pandora Summerfield, CEO of Down’s Syndrome Scotland, said the event was a culmination of five years of planning. Last month, the British Medical Association (BMA) urged the Government to launch a full consultation on the Down’s screening test. Speaking at the BMA’s annual meeting, Dr Mark Pickering warned about the screening programme leading to “more stigma against children born with genetic conditions”. Ciarán Kelly, Deputy Director at The Christian Institute, has said that the test “has its roots in the idea that some people’s lives have no value”.